During much of the Cold War, America's first line of defense was in outer space: a network of secret satellites that could provide instant warning of an enemy missile launch. The presence of these infrared sensors orbiting 22,000 miles above the earth discouraged a Soviet first strike and stabilized international relations between the superpowers, and they now play a critical role in monitoring the missile programs of China, India, and other emerging nuclear powers. Jeffrey Richelson has written the first comprehensive history of this vital program, tracing its evolution from the late 1950s to the present. He puts Defense Support Program operations in the context of world events--from Russian missile programs to the Gulf War--and explains how DSP's infrared sensors are used to detect meteorites, monitor forest fires, and even gather industrial intelligence by "seeing" the lights of steel mills. These satellites, reveals Richelson, detected Iran's test firing of a new missile in 1998 and even provided clues to the cause of the TWA 800 disaster. 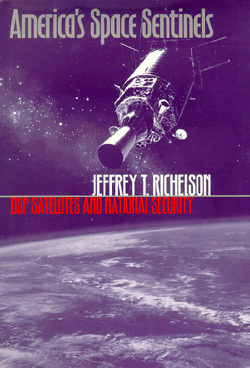 Drawing on many previously classified documents and on interviews with key participants, Richelson provides a wealth of new information: the use of DSP for detecting intermediate-range missiles, false alarms generated following the attempted assassination of President Reagan, the controversial U.S.-Australian DSP partnership, and the role of DSP in Desert Storm. He describes the Slow Walker and Fast Walker programs used to detect aircraft for the U.S. Navy and spacecraft for the Air Force Space Command. And he offers insights into the controversey over what kind of system will eventually replace DSP. No other book covers the story of these eyes in the sky in such absorbing detail. America's Space Sentinels is a groundbreaking account of a little-known program that has well served our defense needs and continues to keep a steadying watch on the world. It enhances our understanding of America's strategic position during the Cold War and the program's capacity to respond to missile conflicts in the next century. "This is far and away the most comprehensive account of the MIDAS/DSP program that exists--and I can't imagine it will be superseded soon. It will certainly become the book on the subject of early warning satellites." "A fascinating report on a little-known type of military satellite that still has a vitally important ongoing mission to deter ballistic missile attacks by 'rogue states' against the United States and its allies." "A very significant contribution in the field of intelligence studies that should attract a diverse readership among persons interested in Cold War and diplomatic history, national security issues, and the aerospace industry." "The definitive account, providing extraordinary details of the satellites and their ground control systems, as well as the bureaucratic politics that have shaped the development of the system." "Richelson knows more about these satellites than anyone outside the U.S. government--and probably more than most inside the U.S. intelligence community as well." Jeffrey T. Richelson is a Senior Fellow of the National Security Archive and the author of many books on intelligence including America's Secret Eyes in Space, The U.S. Intelligence Community, Sword and Shield: The Soviet Intelligence and Security Apparatus, and A Century of Spies: Intelligence in the Twentieth Century.